The threatening bank letters section of this site has proven alarmingly popular, so much so that I may, unfortunately, have to make it a regular feature. There doesn’t seem to be anywhere else that the citizens of Ireland can go to report the threatening and bullying behaviour of our banks, particularly the so called Pillar Banks, AIB and Bank of Ireland. As Pillar Banks you would expect that the behaviour of these two bailed out behemoths would have improved substantially, but it would appear not. The amount of emails I’ve received with the subject ‘banks send out threatening Christmas letters’ is sickening. It appears that hubris is alive and well in Irish financial institutions and arrogance has, if anything, increased since these banks helped ruin our economy. If you doubt this take a look at the following letter (edited to protect the identity of the reader). This is a letter received by the reader on Christmas week 2012, threatening legal action in the recovery of a debt and giving the recipient 10 days to pay the debt in full – essentially the period from Christmas to the New Year. 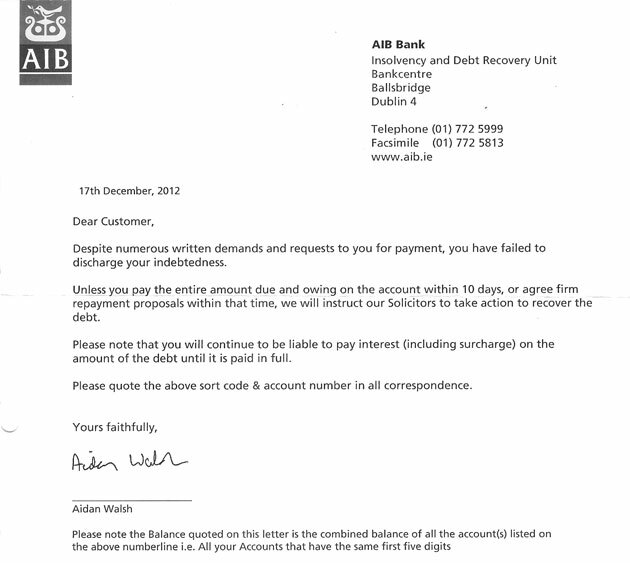 The reader says he has tried to reason with the bank, no surprise that it is Aidan Walsh of AIB’s Insolvency and Debt Recovery Unit again, he does after all have a previous track record in sending out this type of intimidatory missive. The reader has outlined to the bank in some detail his inability to pay at this particular point in time and has asked for some time to get his affairs in order. The bank has singularly refused to listen and says his debt repayment proposals are not to their liking – in a very intimidatory fashion and at an extremely sensitive and emotive time of the year. This would appear to be a deliberately intimidatory tactic on the bank’s behalf. The worst part of all this is that, if you look at this letter, as well the one highlighted on the previous page. they appear to be templates, set out by AIB management. It appears that this intimidation and bullying is standard institutional practice in these organisations. This is absolutely outrageous ‘business’ practice and should not be tolerated on any level. If banks send out threatening Christmas letters to you feel free to drop me a line on info@diarmaidcondon.com as I feel it is a practice that needs to be highlighted to the wider community. These banks have been bailed out using our money, they must be reined in and the Financial Regulator, Matthew Elderfield, does not appear to be willing or able to do so.